Greetings from Astana, Kazakhstan! The last few days have been long, but nothing short of exciting. I arrived in Astana at 5:50 AM local time on Friday morning, after the long journey. I confess this is my first time covering a Presidential election as a member of the international press corps. But I have been a member of the “press” in Kazakhstan before, as I had traveled with a group of journalists to cover the opening exhibit of the “Khorgos II” special economic zone in October 2013. But this cohort has a United Nations of press people, with TV reporters and print journalists from Vietnam, the Netherlands, South Korea, South Africa, the UK, Canada and Italy. There’s one other American – a DC-based photojournalist. The day was jam-packed: Press briefing with Foreign Minister Idrissov, a visit and briefing to the Astana EXPO 2017, and an interview with the leadership team of the self-nominated candidate Abelgazi Kussainov (unfortunately Kussainov was in a different city). On Saturday, I toured three factories located within the Astana Economic Zone and then went to a press briefing hosted by Public Election Monitoring Commission Chairman, Nurlan Yerimbetov. And I’ve managed to squeeze in a few visits with friends. I am going to hold off on commenting on the elections, as I was only able to meet with one of the candidate’s team, and today is the official “day of silence” before the elections. I am reluctant to share an opinion until after I have the opportunity to sit down with all three candidates’ representatives. In this post, I want to contextualize the political-economic environment in which the elections are occurring, and how some members of Kazakhstani population view themselves and the future of their country. I was fortunate to ask Foreign Minister Erlan Idrissov at the press briefing for international journalists. My first question: Kazakhstan is a member of the Eurasian Economic Union (EEU) and Eurasian Customs Union (ECU), which are part of its goal of “being land linked, rather than land locked” and maintaining a multi-vector foreign policy. Kazakhstan has also expressed its intention to join the World Trade Organization (WTO). During its first few years of implementation, we have seen a number of unanticipated and anticipated challenges to the ECU. For example, there were bans on the export of certain oil and gas (O&G) products, such as Kerosene, from Kazakhstan, and Kazakhstan also prohibited imports of halal products from Russia. The beginning of any economic institution is always challenging – after all, NAFTA was not easy to negotiate, let alone implement early on. How has Kazakhstan addressed these initial challenges? How is Kazakhstan working with Russia and Belarus to address anticipated challenges and predict unanticipated challenges? In his answer, Idrissov agreed that these challenges are a natural part of the beginning of any new trade-economic union. He noted that many of these trade issues were not caused because of ECU membership, but because of three external factors: Western sanctions against Russia, the fall in the value of the ruble and the tenge, and a drop in global commodity prices. These developments affected the workings of the EEU, creating the “bumps in the road.” Idrissov emphasized that all of these trade actions were taken in consultation with other members of the ECU with the understanding that they are temporary policy measures, rather than fundamental changes in Kazakhstan’s long-term trade policy. Idrissov added that the response of Kazakhstan and the entire ECU to negative market developments is an indication of the long-term sustainability of the ECU insofar as members can collectively discuss issues and formulate a solution. With respect to WTO, Idrissov added that Prime Minister Karim Massimov recently returned from a weeklong trip to Washington, D.C. And as a result of the trip, Kazakhstan and the United States formally concluded their WTO negotiations. Now Kazakhstan must negotiate with a few more members. Readers, believe me, as a follower of Central Asian relations – the fact that Kazakhstan and the U.S. completed WTO negotiations is a BIG deal. This development is a real step towards Kazakhstan joining the WTO by the end of 2015. To add in my analysis…I was very glad to hear Idrissov explicitly state that such measures were taken to support Kazakhstani producers, as I previously interviewed Kazakhstani entrepreneurs who were dissatisfied with the reforms taken to support the competitiveness of domestic industry prior to joining the ECU. Thus, steps taken by the Kazakhstani government to limit imports of select products was motivated, in part, by the imperative to protect domestic producers. At one level, it is interesting to consider the Customs Union within the context of global trade patterns. Almost all regional trade groups face issues and domestic business elites are always major stakeholders. Look at the problems associated with reforming agricultural policy in the EU, and pushback from farmers. The fact that Kazakhstan – and Russia – have domestic business elites who are interacting with their governments indicates that businessmen are integrated into the global economy and is a positive development insofar as they have something of value they want to protect – their businesses. It is also interesting to think about the Customs Union relative to Kazakhstan’s economic development as a whole. Kazakhstan is a middle-income country with an average per-capita GDP of over $13,000. Kazakhstan in that respect faces the traditional development challenges of all middle-income countries, in that it has more complex development challenges and obtaining 8% growth rates per annum is simply not a reality. Plus, Kazakhstan’s development is further challenged by fluctuations in commodity markets, as O&G generates nearly 60% of the budget revenue. Kazakhstan’s future growth, therefore, depends on its ability to develop a competitive advantage in select, strategic sectors. As I mentioned, today we toured three factories in Astana’s industrial park. While I will detail the excursions in a later post, let me share one anecdote. The General Manager of a train factory explained how the factory relies on steel imported from Russia, as this steel has unique chemical properties that allow it to keep its shape at high temperatures. 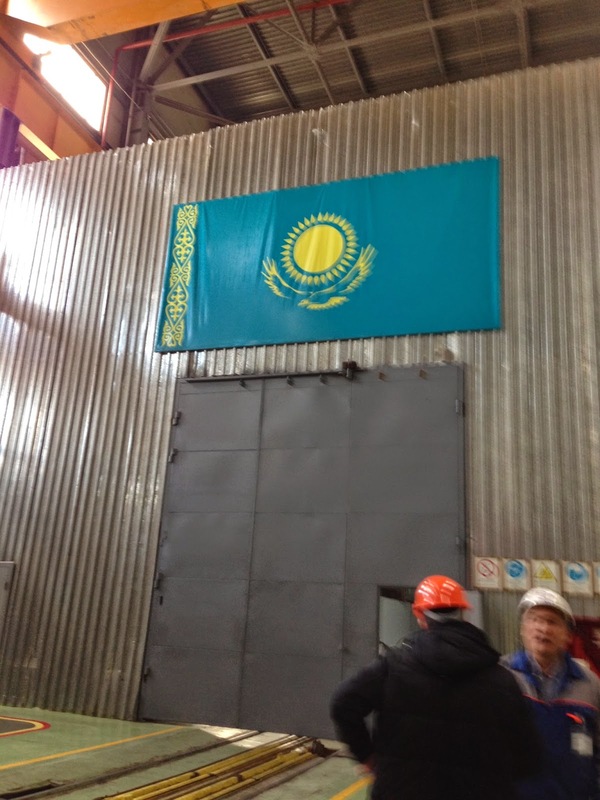 One of the goals of the factory is to use steel from Kazakhstan. While Kazakhstan produces steel, it does not yet produce this kind of steel. But it has the potential to do so. The factory is working with ArcellorMillar in Kazakhstan to modify their upstream manufacturing and processing procedures so as to enable the factory to locally source the materials. This will help increase the percentage of “localized material.” Currently, 24% of inputs are local sourced. At the same time because “localization” is defined by products that are from Kazakhstan and/or from the ECU, the steel imported from Russia technically is counted as “localized.” Thus, Kazakhstan’s economic development relies not only on international investment, but also on the investment into strategic competitive industries. This is about developing the sustained capacity to export high-value, niche products. But this process starts with more basic investment projects – such as a train factory, generates value-added spinoffs that increase Kazakhstan’s competitiveness relative to global standards and relative to other ECU members. This is no easy task. My second question to Minister Idrissov (that was one, multi-part question), was: In a low oil-priced environment, how is Kazakhstan working to sustain investment in the O&G sector, particularly in upstream production? Idrissov first responded that Kazakhstan is trying to attract investment into the non-extractive resource centers. Kazakhstan has implemented a variety of measures to attract investment, such as tax holidays, the creation of a “stop-and-shop” facility for foreign investors and a relaxation of restrictions on foreign work visas. There is also a new law, under which a foreign company that invests $20 million into the construction of a new industrial facility, and the investor is reimbursed 30% of their initial investment after one year of the facility’s successful operation. Such measures were not introduced in response to the fall in commodity prices, but are part of Kazakhstan’s overall plans for economic diversification and development. Until next post – Сау Бол!